Browse: Home / Stop Pig Industry Expansion in Manitoba! Pigs in Manitoba need your help! The provincial government just introduced Bill 24—legislation that guts environmental regulations, weakens measures that protect pigs from barn fires, and effectively lifts a ban on building new pig barns which has been in place since 2012. In response, Manitoba Pork now wants to build 80 new pig barns—sentencing another 1.3 million pigs to lives of confinement, deprivation and cruelty. Manitoba already has the largest pig industry in the country, killing over eight million pigs a year. As we’ve seen from undercover investigations, abuse and neglect run rampant in the pig industry. We cannot allow more sensitive and sentient beings to be born into this nightmare existence. Manitoba is still coping with the devastating ecological and social consequences of past pig industry expansion. Twenty years ago, the government let the pig industry double in size by gutting regulations. As a result of the massive growth, pig farm waste runoff doubled the phosphorus load on Lake Winnipeg, contributing to the growth of deadly algae. If you’re a Manitoba resident, click here to send a pre-written letter to your MLA asking them to protect animals and the environment, not the profits of the pig industry! If you’re not a Manitoba resident, please copy and paste the pre-written letter below into an email to all Manitoba MLAs (addresses provided below – just copy and paste into an email)! I am writing as a concerned Canadian to urge you to vote against Bill 24 – The Red Tape Reduction and Government Efficiency Act. Bill 24 weakens environmental regulations, removes two important protections for pigs from barn fires, and effectively lifts the moratorium on the building of new pig barns which has been in place in the province since 2012. The bill opens the door to unrestricted growth of the pig industry at a time when the province is still coping with the devastating ecological and social consequences from the last time it was allowed. Manitoba already has the largest pig industry in the country, producing over eight million pigs a year — a number which doesn’t even reflect the total number of pigs born into the industry, as an estimated 11 per cent die before even leaving the farm. The lives of these eight million pigs was exposed in an undercover investigation at a pig barn in Arborg just a few years ago. The footage showed horrific abuse, including the confinement of pregnant pigs in barren crates so small they were unable to turn around, the mutilation of piglets without any pain relief, and the complete lack of medical attention for sick and suffering pigs. 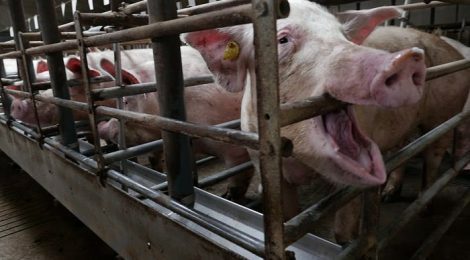 Earlier this year, Manitoba Pork expressed its desire to build 80 new pig barns, sentencing 1.3 million more sensitive and sentient beings to lives of confinement, deprivation and cruelty. Don’t let this happen. Please protect animals and the environment, not the profits of the pig industry. Please vote ‘no’ on Bill 24.